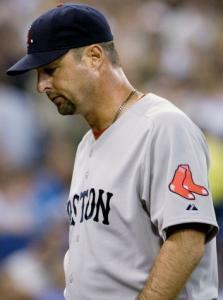 TORONTO - Traditionally, Tim Wakefield has performed well in domed stadiums. Wakefield carried a .618 winning percentage in domes into last night's game, compared with .528 outdoors, with a 3.93 ERA indoors and 4.36 outdoors. That is why one Toronto pitcher said last season that the Blue Jays try to make sure the roof at Rogers Centre is open for Wakefield's starts. But rain threatened last night, and the roof remained closed. However, it did little to help Wakefield. The knuckleballer submitted his second-worst outing of the season, matching the 4 2/3 innings he pitched May 13 against the Angels, allowing six runs, one fewer than he had in that appearance. It ended the same way, however, with a Sox loss, this one 6-3 in front of 32,026, ending the Blue Jays' nine-game skid. "I was struggling throwing strikes, and when I did throw strikes it was pretty good," Wakefield said. "I just didn't make the pitch I needed to in the fifth inning. I had two outs, runner on second. I had the count 1-2, especially with [Kevin] Millar. I couldn't put him away. It's one of those things. Felt like I was throwing good knuckleballs, they just laid off the really, really good ones down in the zone, especially Millar." Millar worked the lone walk in a stretch of four two-out hits. Instead of escaping with a 2-1 lead, Wakefield walked off the mound with the Sox trailing by four runs. "We just can't convert that third out," said Sox manager Terry Francona. "Wake left some balls up. When they get hit - we just couldn't get that third out." And couldn't get a hit at the right moment. Even with an edge-of-the-seat performance from Casey Janssen in which the Sox couldn't make much of their 11 hits and some wicked liners that were caught, Boston was not able to score more than three against a pitcher who had not won in two years, and not won as a starter in three. "Sometimes you need two-out hits," Francona said. "We actually had some offense. We had a bunch of hits. We had five hits early, we just didn't do much with it." With the Blue Jays putting the Sox in a hole, another troubling statistic came to light. Since Francona moved David Ortiz from third to sixth in the batting order, the Sox have not scored more than three runs in a game, winning just one of four. Last night, Ortiz came to bat in the first inning with the bases loaded and two outs. He drove the ball deep to center field, but Vernon Wells tracked it down in front of the wall. Ortiz finished 0 for 4, dropping his average to .189. "All I can do about myself right now is laugh," Ortiz said. "Because I ain't going to cry. Laugh. Keep on swinging. And wait for the good-luck charm to show up. There's nothing else I can do." Wakefield was more pragmatic: "He hit it good. He hit it really good. But it's an out, unfortunately." "I think David would be much more encouraged if he had four RBIs to show for it," added Francona. But he didn't, and the Sox also couldn't convert in the second inning, when they had runners on second and third with one out. Dustin Pedroia lined softly to second base, and J.D. Drew grounded to second. The Sox got only single runs in the second, fourth, and seventh, the final coming on a homer by the slumping Drew. There was a bit of salve in the form of Daniel Bard. But even with Bard doing his best to keep the game close, allowing just a walk over 2 1/3 innings, and ending his outing with five straight strikeouts, the Sox were not able to rally. Wakefield exited after five Toronto runs in the fifth. He got two outs fairly easily, on a fielder's choice (after he hit Alex Rios with a pitch) and a ground out by Adam Lind. But the next five Blue Jays reached, on a double by Scott Rolen, a walk to Millar, a double by Lyle Overbay, a single by Rod Barajas, and a double by Marco Scutaro, leaving Francona little choice but to pull Wakefield. Two four-seam fastballs later - which must have looked as if they were traveling 115 miles per hour after Wakefield's knucklers - the Sox were out of the inning. But they trailed, 6-2, after entering the inning leading, 2-1. For a team with championship aspirations, the Sox have done little to demonstrate that they can win consistently on the road. They split four games this week in the Metrodome, a tough place to win, but are just 11-15 overall away from Fenway Park. And last night they couldn't get it done against a team that had lost nine straight. "It's tough on the road," Drew said. "You've got to really bear down and focus, and push runs across when you can. I don't think we've done that."